When it comes to despair and loneliness, there is perhaps no better musical catharsis than this month's selection, sung by the incomparable Will Oakland. 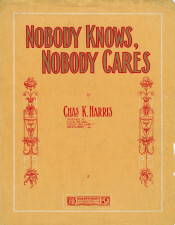 One of the great but lesser-known sentimental songs, "Nobody Knows, Nobody Cares" like many of this period, reflected tensions brought about by the growing industrialization and urbanization of society. Fast-forward a century and this song could easily be addressing the growing abstraction of human contact and isolation felt within computer-based social-networking societies. 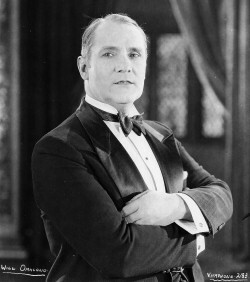 Will Oakland's countertenor voice (singing between the tenor and soprano ranges) and his stylistic delivery were perfect for sentimental songs, that, combined with Charles Harris' (a.k.a. the "King of the tear-jerkers") skillful songwriting, produced this sublime early recording of Harris' emotional ballad. Few recordings have been rendered with such striking combination of sentiment and singer as this. Courtesy of the YorkSpace Institutional Repository. Will Oakland, 1926. Courtesy of the Internet Movie Database.